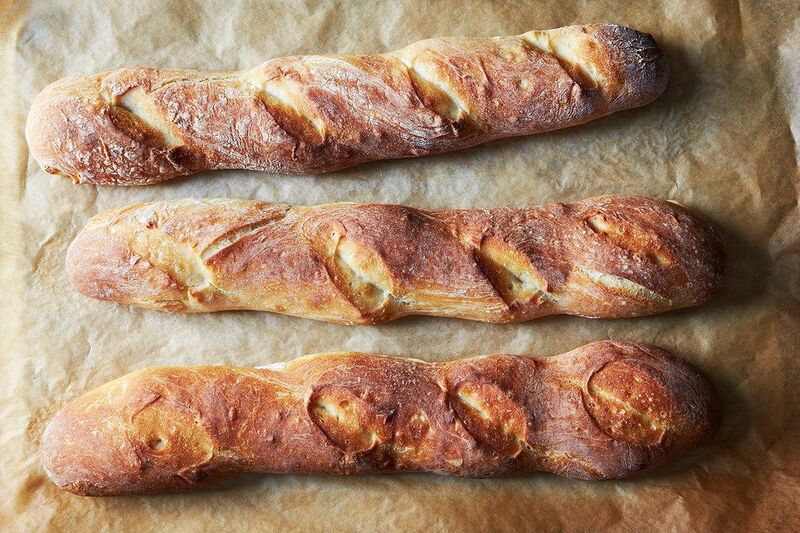 Today: You can make baguettes at home -- in 4 hours, from nothing -- and they'll disappear faster than your favorite bakery's. 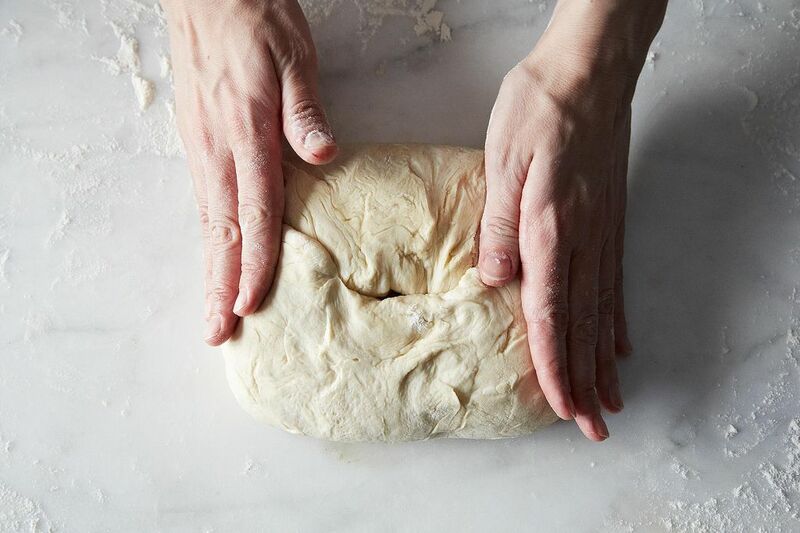 Raise your hand if you've always wanted to get into the rhythm of baking your own bread. Now raise your hand if you've actually done it. Right. This recipe is the aggressive, no-more-excuses shove that we need. It comes from Dan Leader, founder of Bread Alone, via William Alexander's IACP-award winning Saveur Magazine story on American Bread. 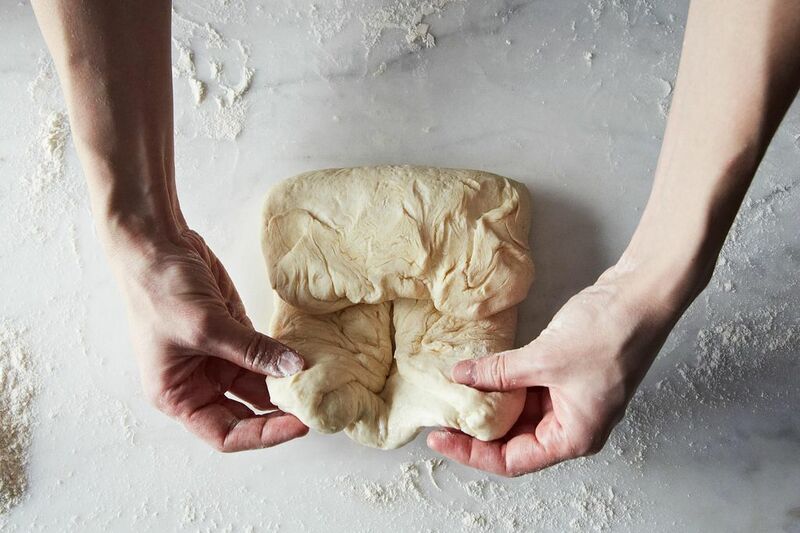 Leader developed the recipe to fit in home cooks' ovens and nestle into their schedules, with ingredients and equipment they've got nearby -- but he told me, "If I had to make it at Bread Alone, I'd make this recipe." 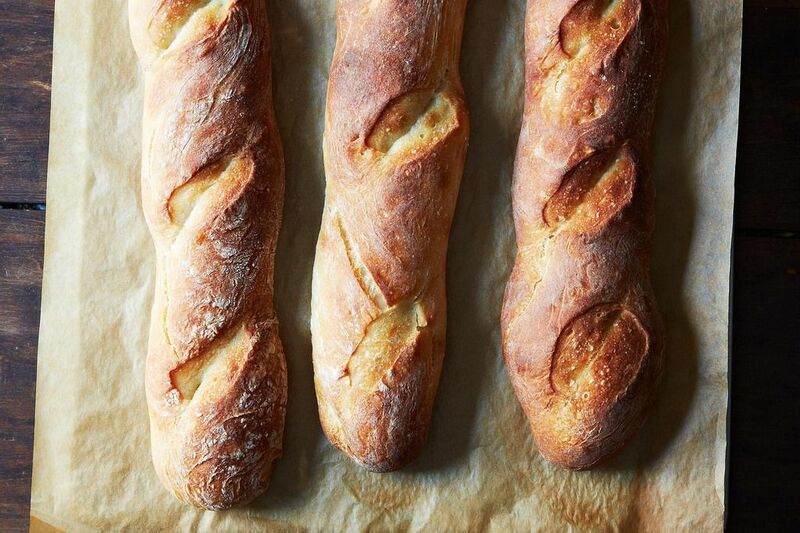 "There are times when I plan out a menu only to realize I forgot to buy a baguette or two and can make this quick." Food52er Ashley Marie told me. 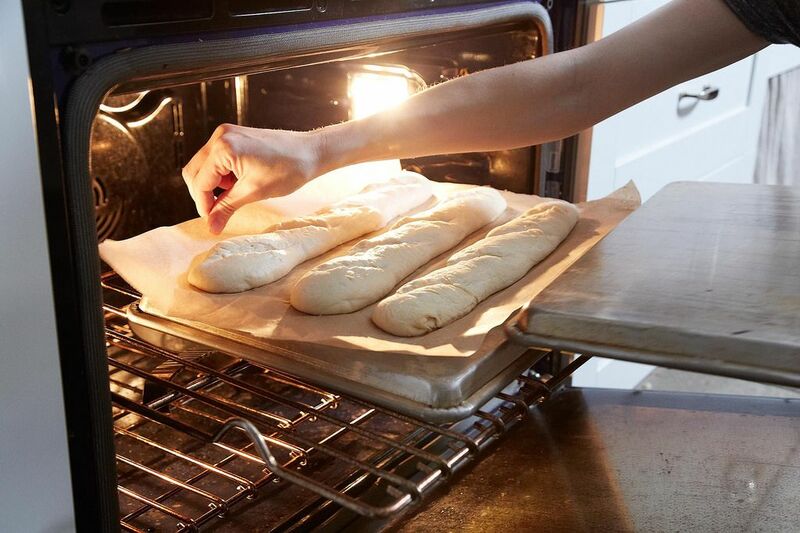 "In addition, I find they're fun for when I want bragging rights for guests ('Why yes, these are really HOMEMADE baguettes I made fresh today')." 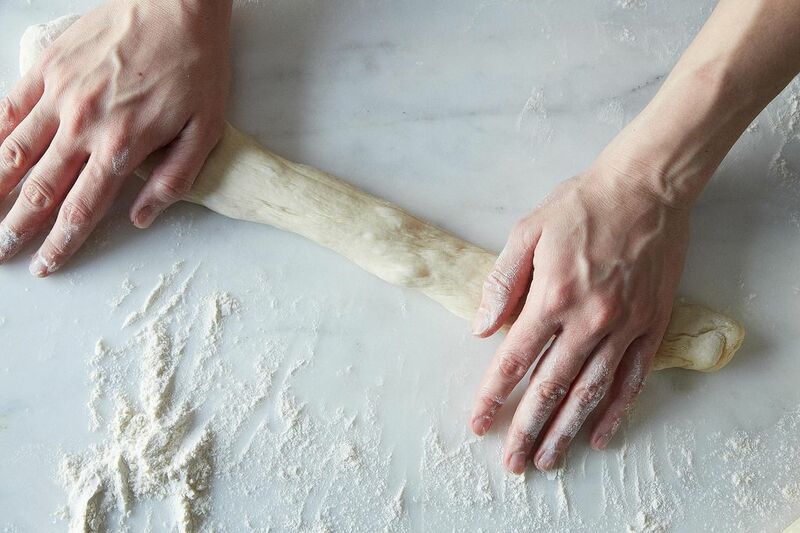 Here's how to do it -- as Leader says, "bread baking is more wait than work." Stir together yeast and warm water. 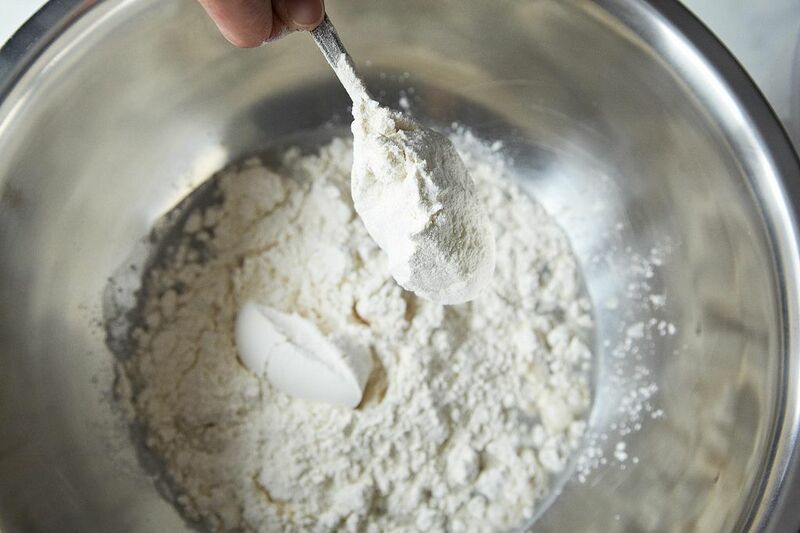 10 minutes later, stir in flour. Let that hang out for 20 minutes to hydrate. Now add salt and knead for about 10 minutes, till it's smooth and springy. 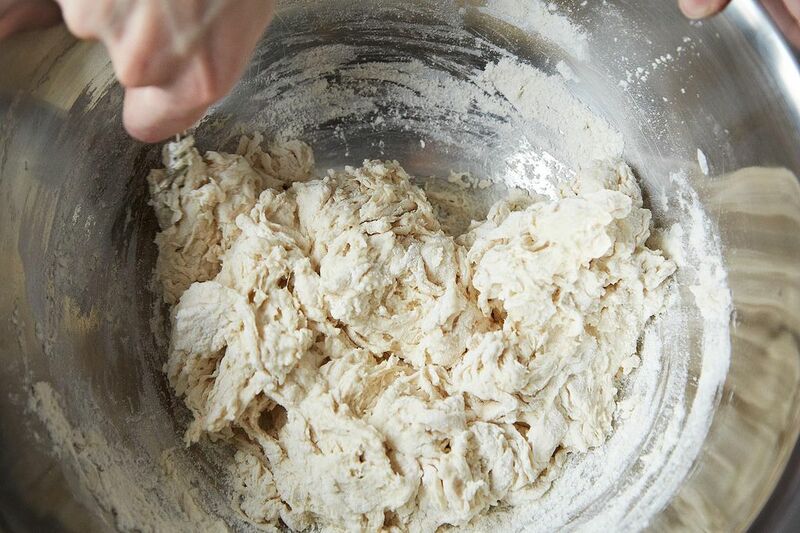 You could do this in a stand mixer with a dough hook -- or food processor, which Alexander prefers -- but I think a good knead is better than an hour of psychotherapy, and it's free. Plop it in a greased bowl, seal it with plastic, and park it in a cold oven (or microwave) for about 45 minutes. Its girth will double. Fold it like a T-shirt, then put it back. Within an hour, it will double again. 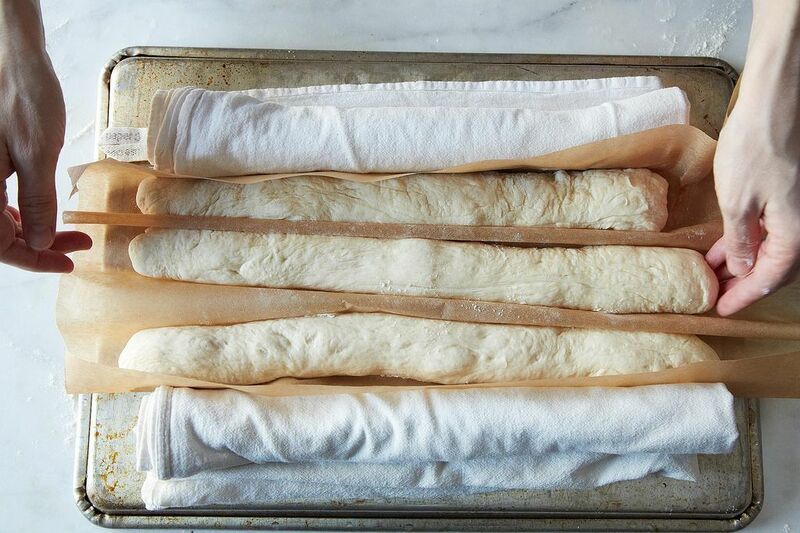 Now roll it into three baguette-like tubes. 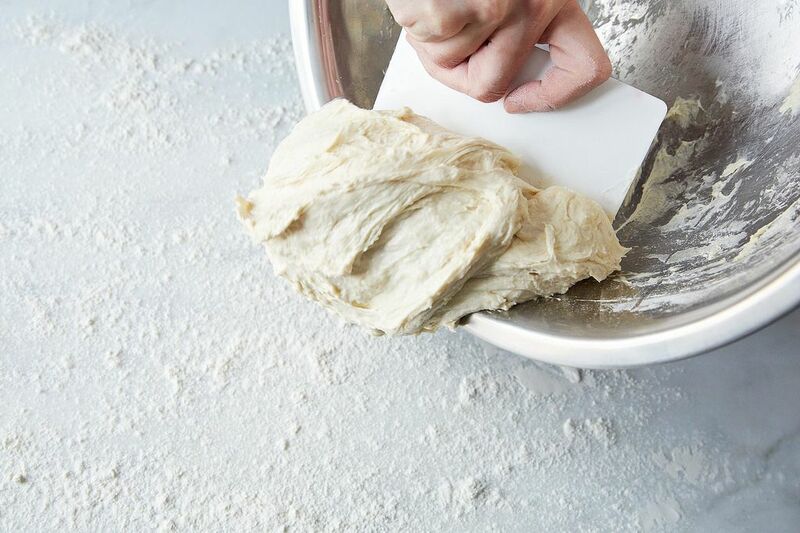 Don't use much flour -- a little sticking will help keep them from sliding around. 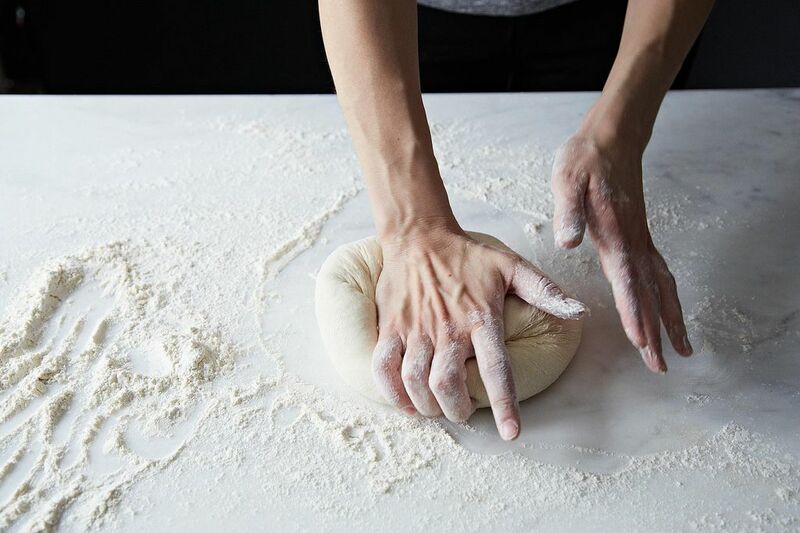 Line your tubes up on a floured piece of parchment, then scoot them together with parchment poking up between each tube of dough. Stick rolled towels on each side as ramparts, so the baguettes rise up, not outward in their last stint. 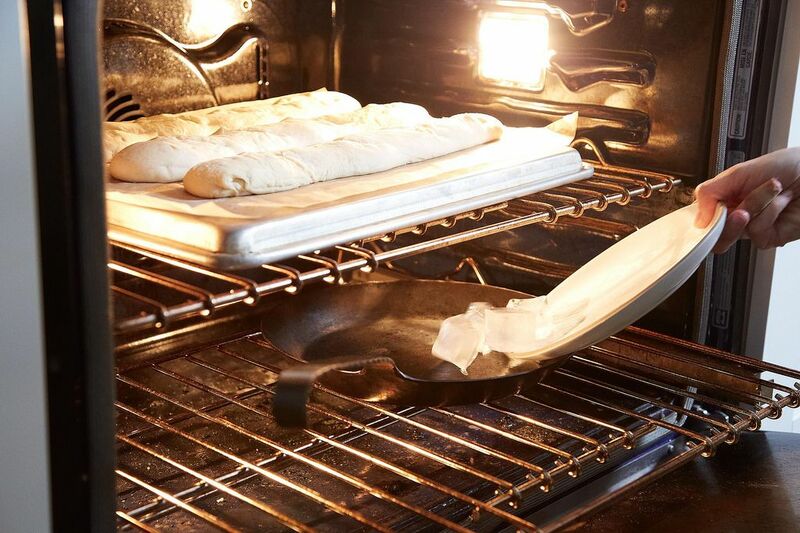 While they double again, heat your oven to 475° F, with a baking stone (or rimless or upside-down baking sheet) in the middle and a cast iron skillet in the bottom (you'll see why soon). 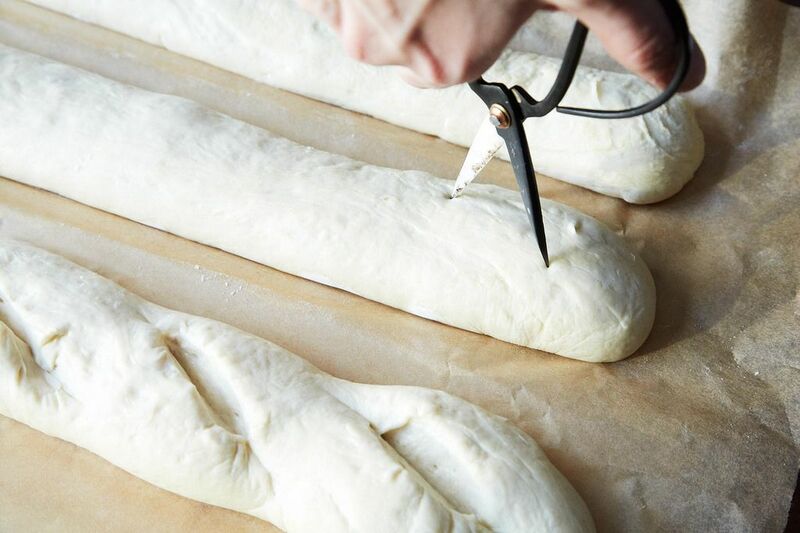 Once the baguettes are puffed and the oven is scorching, slash the tops with your fancy lame, or just snip them with scissors -- a trick I learned from our Test Kitchen Assistant, Erin McDowell. A knife that isn't razor sharp won't help you here. 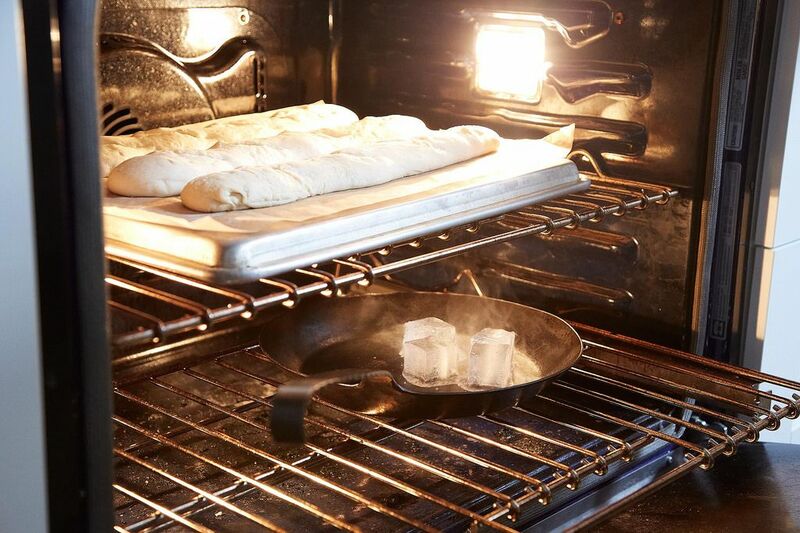 Now this is the only part that takes coordination -- pull out your middle oven rack, confidently slide the parchment with loaves onto the stone (or faux-stone), then tuck the rack back in and pour ice cubes into your hot skillet. Shut the oven and walk away. Set a timer for 20 minutes. This steam will help the loaves finish rising before the crust forms. And what a crust it will be. Four hours ago, this was still flour in a bin and yeast in a packet. You brought it to life, with the hands you have, the bread experience you don't. And you'll do it again soon. Got a genius recipe to share -- from a classic cookbook, an online source, or anywhere, really? Please send it my way (and tell me what's so smart about it) at [email protected] Thanks to Food52 community member Ashley Marie for this one! 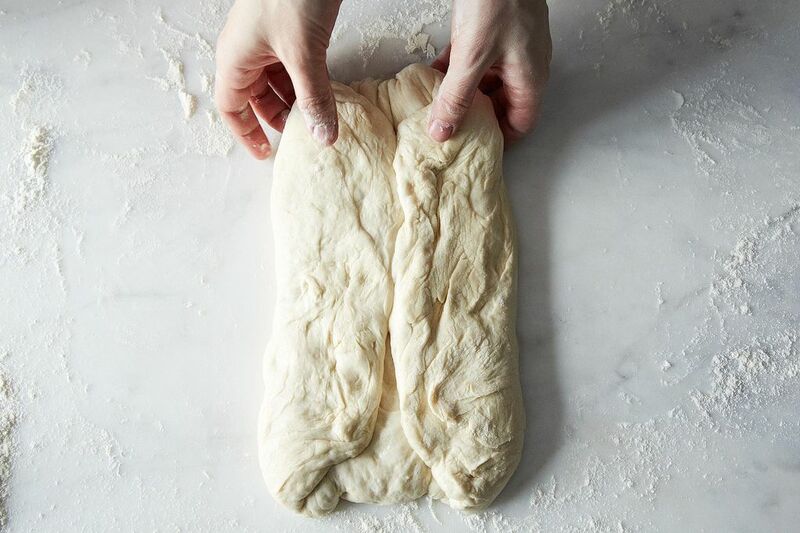 I found the recipe for your 4 Hour Baguette at Food 52 (https://food52.com/blog/10044-dan-leader-s-4-hour-baguette). I've made it several times and actually have one in its first rising now. While it is absolutely delicious it frustrates me to no end. 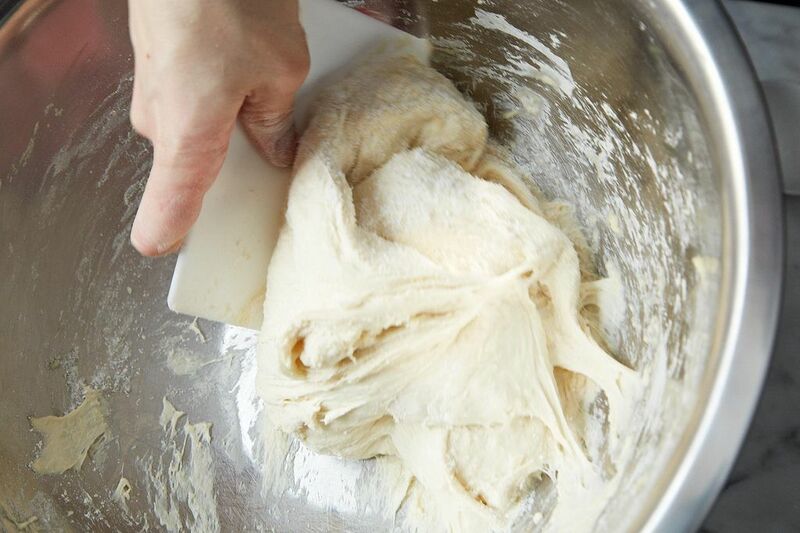 I realize the dough should be tacky on the sticky side, but it is wet and sticky, almost impossible to knead by hand. Thank God for my 40 year old KitchenAid! I'm hoping you can/will answer some questions. Do you have the recipe in weight (grams) rather than volume? If so will you share it with me? 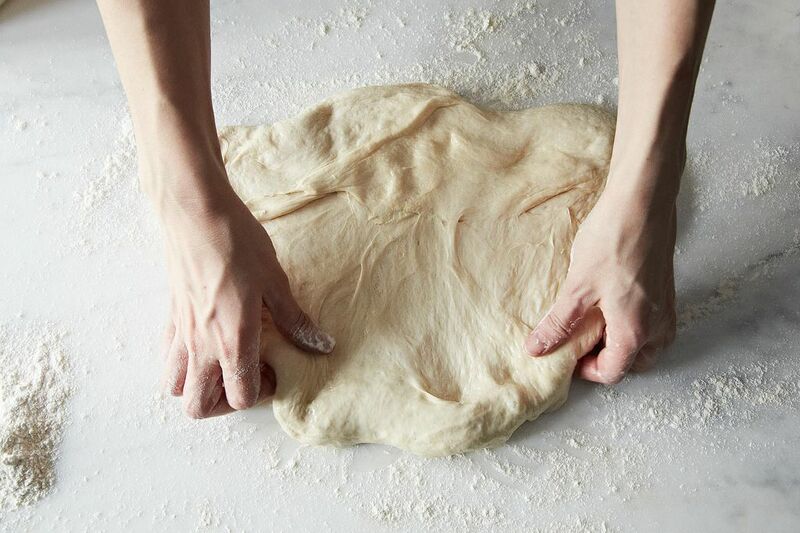 Should the dough be so difficult to handle when kneading by hand? 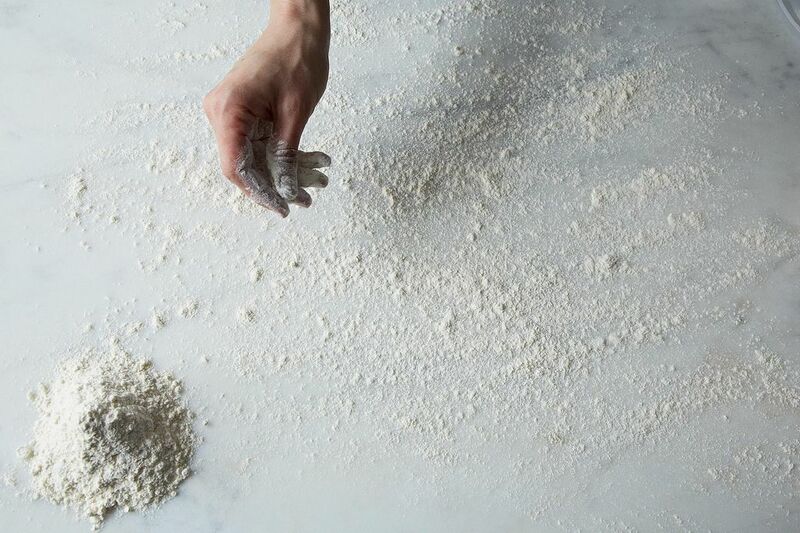 Is the amount of flour and/or water correct in the recipe they posted? This recipe was adapted from my book Local Breads which has all recipes in metric as well. 2.5 grams instant active yeast. 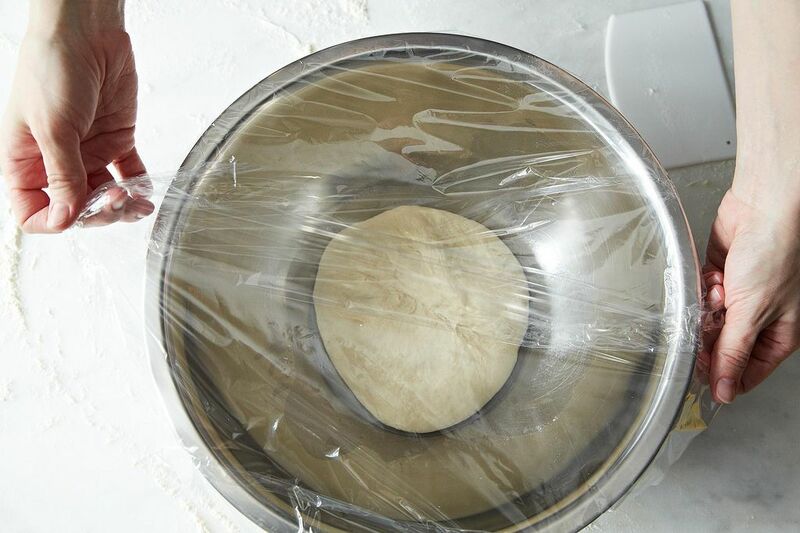 You can leave the dough for a 1 hour autolyse for more elasticity. I have a new book out October 1st called Living Bread. I've been making a LOT of bread since I last commented on THIS bread in 2015. 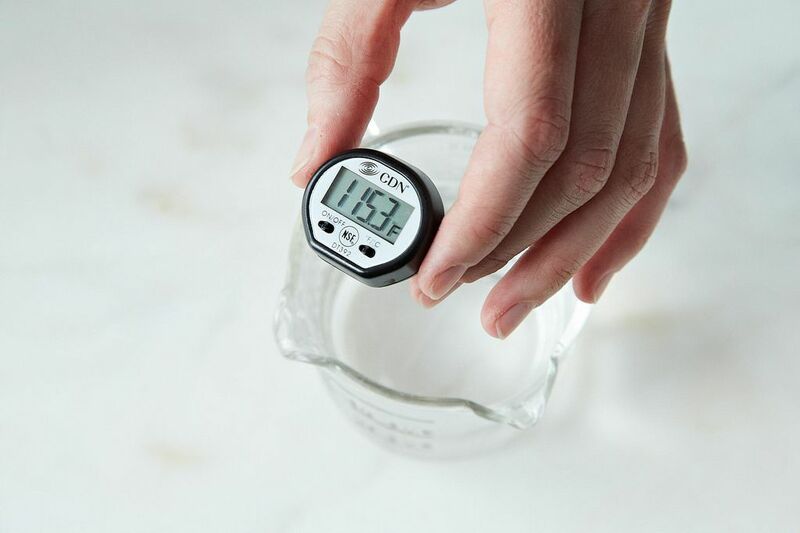 I now only use recipes that give their ingredients in weight (my preference is by grams) instead of volume and I always, always, always proof my yeast. 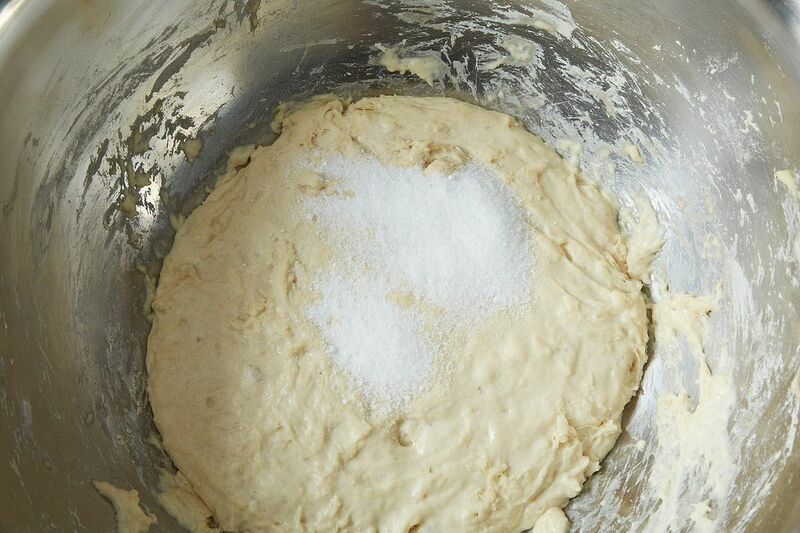 I also whisk the salt with the flour before adding my always, always, always proofed yeast and the rest of the liquid. King Arthur's Flour has a handy dandy little chart for ingredient specific conversions: https://www.kingarthurflour.com/learn/ingredient-weight-chart.html which I find invaluable. I'm going to make this bread again this week, this time using the gram conversions I didn't use the first time, when my bread was absolutely delicious but didn't quite hold it's shape. 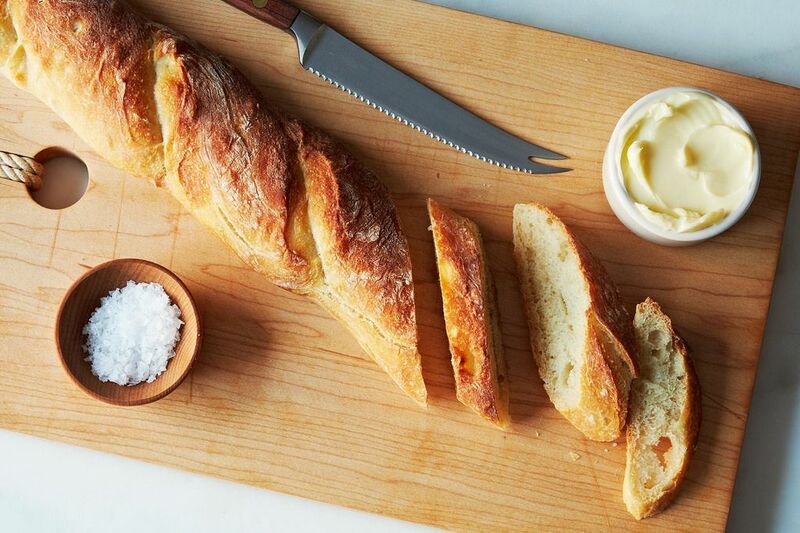 It is tricky to recreate baguettes using American flour, which is milled from Durham wheat. 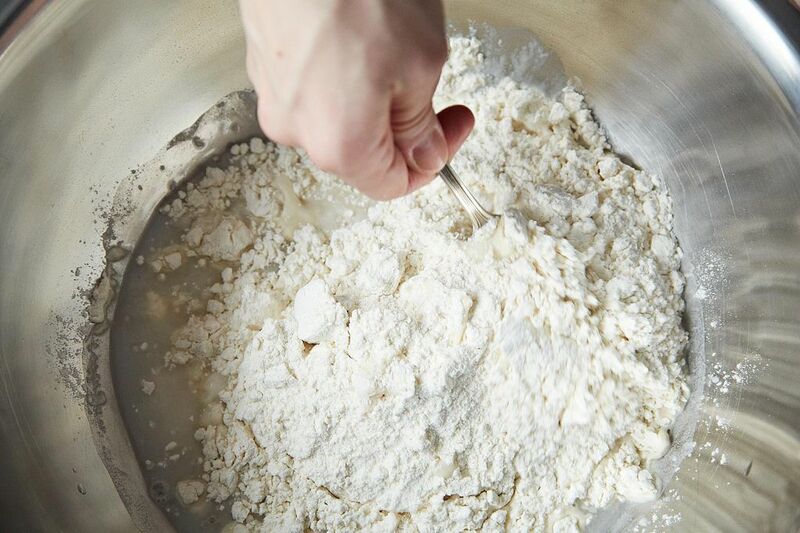 Try King Arthur's French Flour, milled from red wheat, widely grown in France. I wish mine looked this pretty!! Will try again!! Quek Hwee Ling, a pizza stone insures a crispy crust but you could invert baking sheets and place the baguettes on the inverted bottoms. Does that make sense? Or use a large non-rimmed baking sheet. I do believe the results will be different but most likely, still delicious. Consider investing in a pizza stone......you won't regret it. I hope this helps. Is pizza stone a must? I don't have one. Tried this recipe for the first time today and according to my daughters it was "the best bread they've ever had!" My husband also agreed! Absolutely amazing results! I've lived in Paris and never managed to find a baguette elsewhere that was decently similar to the Parisian ones, but this really got me close. And it was only my first try, so I am confident practice will make it just perfect! THANK YOU! I am in love with this bread! I just took it out of the oven and have already wolfed down a half a loaf! I followed the recipe exactly except that I added a couple tablespoons of Bob's 7-grain hot cereal to the dough as I kneaded it in my kitchenaid mixer and a little more flour to get a firmer dough. Baked it on my pizza stone--it is crisp on the outside and nice and chewy on the inside. Perfect! I wish you would check the links included in this recipe. The proofing oven on Amazon got the worst possible rating for very obvious reasons. THE WHEAT FLOUR IS DIFFERENT IN EUROPE, this is why it taste different. THE USA wheat lacks something. The sourdough needs a old ''mother starter' that i'ts reused again and again also needs to be fermented from 12 hrs up to 20 hrs.. In France, Spain, Portugal porssible in Italy, they use a different kind of wheat for their bread. The butter is unsalted. and some bakers use O.oil instead of butter. NOTE: 3 and 1/4 cups flour does not equal 14 and 2/3 ounces. It equals 26 ounces. I had to look twice when the dough after adding flour to yeast mixture was very runny. Wish I could but I just don't know. Please let us know what you learn. Anyone out there care to comment on my comment that the French bread actually made in France seems to have an interior dough with a somewhat "waxy" sheen/feel to it? That's the only way I can describe it. Again, any chance they mix olive oil or perhaps unsalted butter into the dough? Dave, the baguettes in France absolutely taste different than any made here. It's all about age-old starters and location, location, location. Not to mention baking equipment that's been seasoned for centuries. But then, I've never tasted sour dough French bread anywhere like what I grew up on in San Francisco, either. Larraburu Bakery. I'll never forget it. It's about the perfect storm of air, humidity and regional micro-climates. It's handed down and unspoken. Above all, it's the touch of the master's hand. Google "Larraburu" if you'd like to get some French bread knowledge under your belt and enjoy a good read. One link even posts their original sour dough formula. Priceless. Bon Appetit! I'm gonna try this because while I have all the ingredients and "tools" I have been too timid to go for the "standard" multi-day prep for traditional french bread. I lived in Paris for two years as a student and one year in Belgium -- then, later, three years in Paris with the State Dept. With rare exceptions, I have been disappointed with :"French" bread made in the US. Call me a snob, but there it is. The crust and holes are critical. But there was something else -- dare I write "je ne said quoi" -- a very slightly "waxy" sheen and feel to the dough after baking. I have no idea what that was but it is lacking in US made breads. 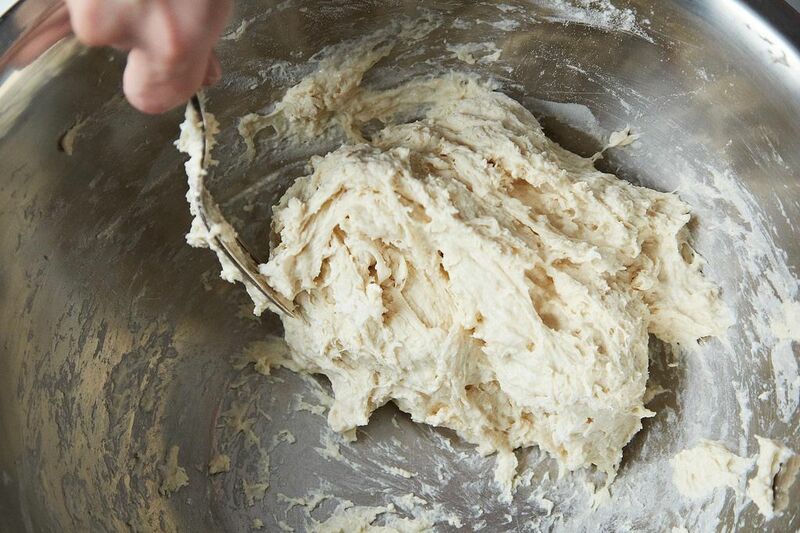 Could it possibly be that French bakers add a small amount of olive oil to their dough? Look forward to others' thoughts and comments on this. P.S. I hate auto spelling correction -- that should be "sais" and not "said". Also, the "waxy" feel I describe is in the interior bread and not the crust, jest to be precise. I spent a semester in Belgium during school and visited many parts of Europe. I'd agree that most bread there is simply better than most bread here. It's the technique and the ingredients. That being said, I make this bread recipe about twice a week since it can be done in 4 hours and is far better than anything I can buy in "regular" grocery stores. Now, we have some French Bakeries here in Omaha that produce some excellent breads, but I can make a really great loaf with this recipe and save $4 a pop. $8 a week translates into a decent amount of beer money over the course of a year. Or, at least that's how I justify it. In this recipe, I use bread flour and add .5oz of rye or barley flour to the mix (or some of each) to enhance the flavor. It makes quite a difference. I also typically just make one big oblong loaf and cut it down the center before baking on a parchment-covered sheet. Turns out great every time. What's slightly incongruous is that we can get really good bread flours up here in Canada: shared continent, terrain and even weather in parts, so how come our flour is better? Well, gee...it is Canada, right? (Just having fun here -- Mom born in Canada and some good friends there.) I'd still like to see some comments regarding "waxiness" of French Bread in France and how they achieve that. Hehe...and it would have helped if I'd been awake enough to finish my sweeping statement, eh! What I meant to add was, the good bakeries way up here in the great white north do manage to churn out a baguette with the crust you describe, very much so....but I don't know how they accomplish that, sorry. So, a total shaggy dog story after all. I always heard that you never mix salt with yeast... salt kills yeast. Is that true? Salt controls the fermentation of the yeast. Too much will kill it. You merely want to inhibit the rise. Yes, it's absolutely true. 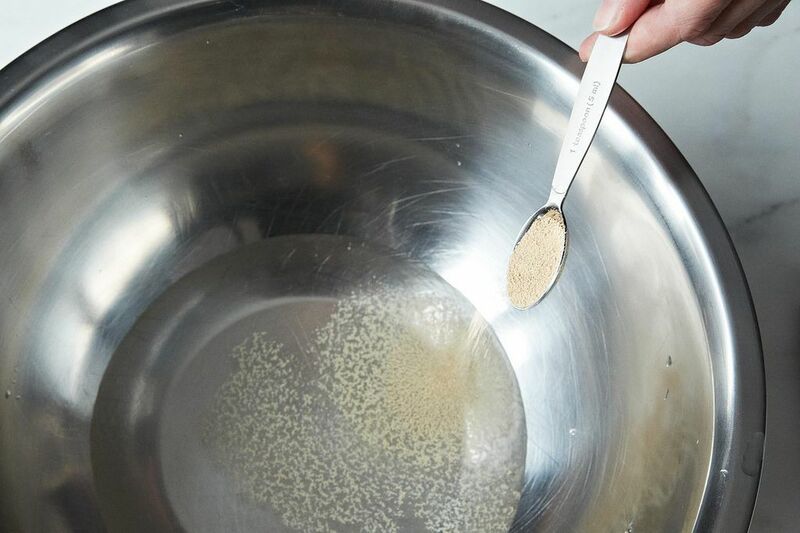 Yeast feeds on sugar. If you introduce salt too early in the process it will definitely kill the yeast. Middle school science class experiment proved this. 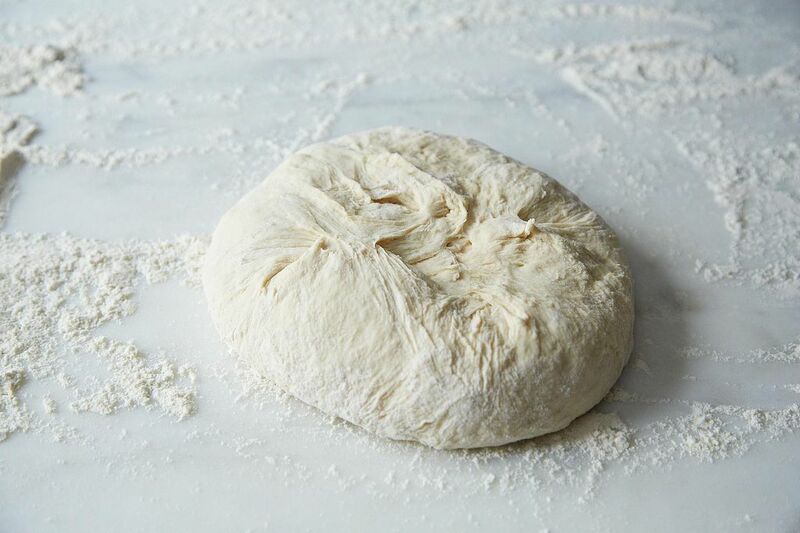 Most bread recipes have you adding yeast last as it impedes the action of the yeast. But, I wouldn't think it would stop all action if added first. Perhaps the water was too hot, the yeast old or a combination of all three things. Hard to say. Saf-Instant doesn't require proofing. You can add it in the beginning. I've used it for 30 years. I messed up somehow, could not get to rise not sure what I did wrong. Water temp to high for active yeast? Adding salt in first step not second step? No rise at all I think the yeast, any ideas.